The last century has seen the development of tape casting technology and the fabrication of thin layers of materials to produce single layer or stacked and laminated multilayer structures. Today, tape casting is the basis of the fabrication process that is routinely used in the production of multilayer ceramic capacitors (MLCC), low temperature co-fired ceramics(LTCC), lithium batteries, fuel cells and many new microelectronic devices. The diversity of applications and new product developments has become the driving force for many of the recent advancements in tape casting machine technology. Tape casting machines have become more automated and other modifications have made fabrication easier and improved quality. 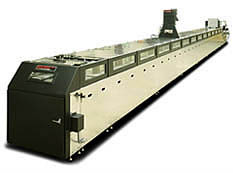 The latest tape casting machines, (Fig.1) produce better tape with more uniform thickness and much thinner dimensions. Tape cast parts now can be made as thin as 1 to 2 microns and as thick as 6 mm. These can be produced to widths that exceed 2 meters and lengths that are only defined by production schedules. This versatility facilitates subsequent procedures to fabricate the final shape or part, many of which could not be produced by any other processing technique. This new generation of tape casting machines integrates a sturdy structure with a solid, level platform that uniformly supports a moving casting surface that may consist of a steel belt, polymer carrier or both. Totally enclosed machines provide a clean room environment to minimize undesirable air infiltration and contaminants. Viewing doors with tempered glass windows and seal tight gaskets allow fast, easy access to the casting station and all other functional areas. In addition, the machines are designed to deliver conditioned casting material consistently to the casting/coating station. The main components of the casting station are the casting head, the casting surface and the web, carrier or steel belt. The casting head can be a slot die, roll coater, adjustable doctor blade or comma bar that is precisely made so as to allow work to tolerances of less than 1 micron. The casting surface substrate can also be a high precision plate such as granite certified flat to 50 millionths. To produce a steady stream of uniform tape requires a stable flow of casting material, perfect control of the casting speed, and drying conditions. Precise control of the tension and speed of the moving carrier or steel belt conveying the tape through the entire tape casting machine is essential to ensure uniformity. This is accomplished by using tension monitors and a digital tachometer with a microprocessor controlled drive and closed-loop feedback system. 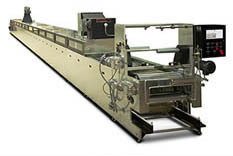 The importance of properly drying the cast tape is a major concern and factor in machine design. The result is that the drying oven on new tape casting machines is carefully designed to maintain a stable temperature profile, atmosphere saturation gradient and air flow. Drying is done in two ways. Heat is gradually applied below the tape while a carefully controlled flow of heated atmosphere is passed over the tape surface. It has been found that more perfect dry tape is produced when these oven conditions are precisely controlled and can be tailored for any tape thickness and drying characteristic. The objective is to dry the tape as thoroughly and as quickly as possible while preventing uneven drying such as forming of a dry skin on the exposed surface of the tape. This defeats sub-surface drying and causes defects like cracking and curling. An adjustable air flow exhaust fan draws HEPA filtered air over the tape in a counter flow direction. As the atmosphere flows from the dry exit end of the tape casting machine oven to the front end where skin formation is the biggest problem it slows and becomes saturated enough to prevent excessive drying. Microprocessor controls and sensors can be set to maintain a desired atmosphere saturation gradient across the drying oven. After drying, the moving tape can be subjected to quality control checks, cut to length, trimmed and slit into narrower widths before being collected or rolled onto a product take-up spool (Fig.2). The newest tape casting machines incorporate the best technology available like automatic web tracking to align the tape precisely so take-up is smooth and seamless as well as other “bells and whistles” that can be added to meet particular product manufacturing needs. 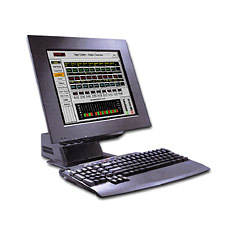 Today, tape casting machines utilize the latest computer control technology (Fig.3) such as human machine interface (HMI) control systems that deliver a simplified operator interface and graphic displays that provide essential information and ease of control leaving almost nothing to chance. These ‘what you see is what you get’ (WYSWYG) systems (Fig.4) are easy to use, shorten operator training time and dramatically increase productivity. Although this technology was limited in the past, there should be no doubt that more recent developments will continue the march of progress in tape casting machine technology. Perhaps this could even lead to the “perfect” machine to make the “perfect” part every time.